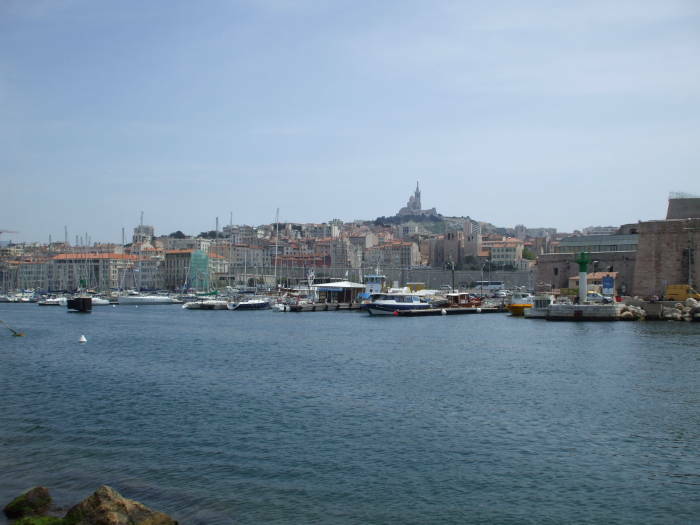 The city of Marseille was founded as a colony by Greek settlers from Phocaea around 600 BC. They called it Μασσαλία, which we spell Massalia or Massilia. By the mid 300s BC the colony was quite wealthy, establishing the Treasury of Massalia at the major religious center of Delphi back in central Greece. The natural harbor had made this an obvious place to settle and led to the colony's wealth. It was the first Greek settlement in what is today's France with the status of πολίς, that is, polis or city. The Greeks weren't the first people to live here. Human habitation goes back to Paleolithic times. Those people left paintings and carvings in local caves back in 27,000 to 19,000 BC. The Mediterranean water level was 110-120 meters lower in that ice age time due to the volume of water locked up in ice caps and glaciers. The paintings were only discovered in the Cosquer cave near the Calanque of Morgiou in 1985. The water level has since risen to the point that the cave's opening is 37 meters below the surface, and from there a tunnel 175 meters long leads inland and upwards until you are above water level within the cave. Any art on the walls within the submerged section, about 80% of the cave, was obliterated. 150 pieces of prehistoric artwork remain. The older ones are 65 hand stencils and related works dating to the Gravettian Era about 27,000 years ago. Then some 8,000 years later in the Solutrean Era, there was a new phase of habitation and decoration. These inhabitants around 19,000 years ago left a number of signs and 177 drawings of animals including bison, ibex, horses, seals, and what look like auks and jellyfish. More recently but still in prehistoric times, Neolithic people built brick homes in this area around 6,000 BC. These have recently been discovered during some excavations near Gare Saint-Charles. The Etruscans, Celts and Carthaginians formed an alliance that was pressuring Massalia, so the city allied itself with the expanding Roman Empire. This provided military security and also brought the city into the lucrative Roman trading network. Its excellent port made it the gateway for trade between inland Gaul and Rome. This trade and travel also led to Massalia being one of the first outposts of Christianity in this part of Europe. Local Provençal tradition, greatly embellished and expanded over the centuries, says that Mary Magdalen and her brother Lazarus landed here in a boat and personally evangelized the locals. Here and below we see Basilique Notre Dame de la Garde overlooking the Old Port and the rest of the city. The Roman Empire slowly crumbled and faded, and here came the Visigoths. They seized this port city. Frankish kings captured the town from the Visigoths in the middle of the 6th century. It was still in Frankish hands by the time of Charlemagne around 800. He granted the city more power, and it prospered under the Carolingian dynasty and on into the Middle Ages. As a port city, Marseille was especially susceptible to newly arriving contagious diseases. It was one of the first places in France to be struck by the Black Death, the bubonic plague, which arrived from the east in 1348. Out of a population of about 25,000, about 15,000 died from the plague in 1348! The population varied with the waves of arriving plagues, and the prosperity varied with the population and also with the city's status. It was favored by a series of dukes and counts, and given special trading status and fortifications by French kings. 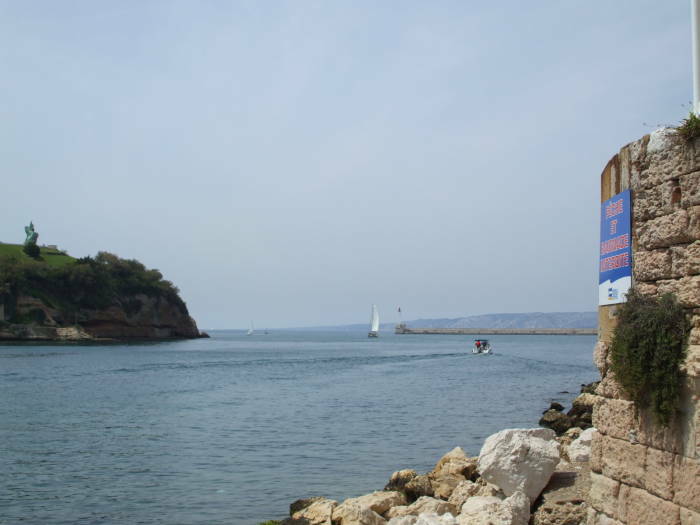 King René led the construction of heavy fortifications of the harbor between 1447 and 1453. The city was then united with Provence in 1481, and all of that was incorporated into the nation of France in 1482. 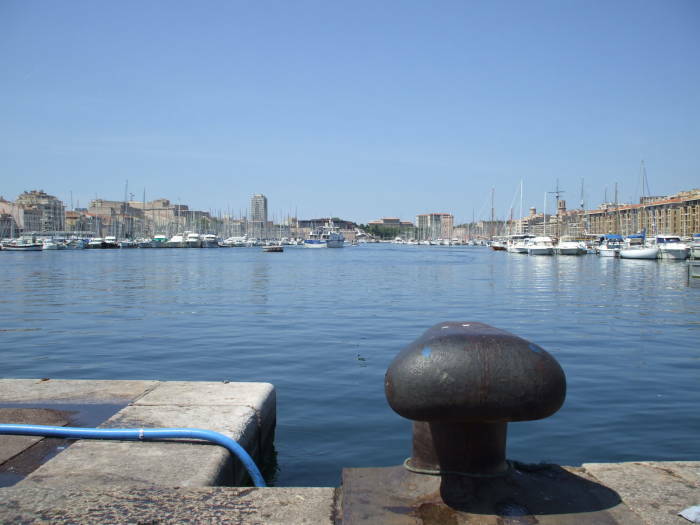 Marseille was a major naval base for the Franco-Ottoman alliance beginning in 1536, and a French-Turkish fleet was based in this harbor. There was another major plague in the late 1500s. 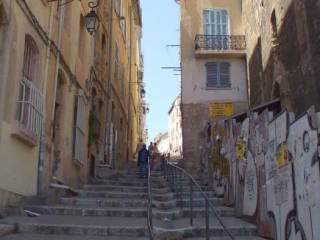 A century later there was yet another uprising, Marseille has always had a tendency to rebel against the central French government. King Louis XIV himself led his army down here on this occasion, and built two even larger forts at either side of the harbor entrance afterward. Then in 1720 the last (so far) Great Plague of Marseille struck, killing 100,000 people in the city and the surrounding provinces. In 1792, the local population was enthusiastic about the French Revolution, as it brought further opportunities for rebellion against the central government. A group of 500 locals marched all the way to Paris to take part in the revolution, singing a song that came to be known as La Marseillaise and later became the French national anthem. 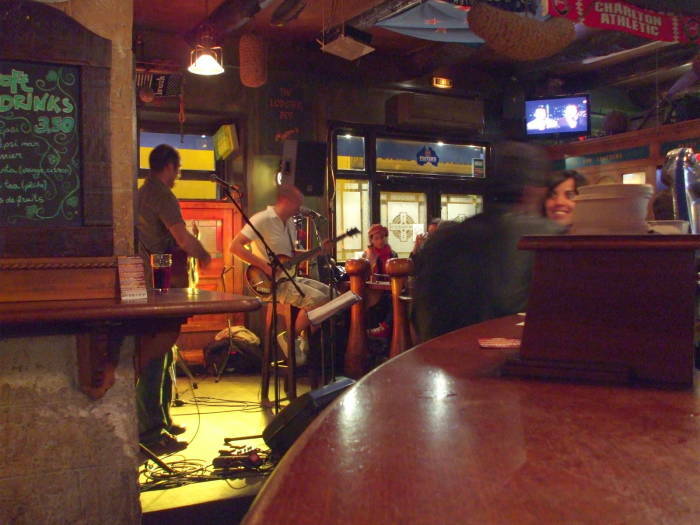 The Old Port is lined with sidewalk cafés and bars. They are open all day and become especially busy in the early evening. 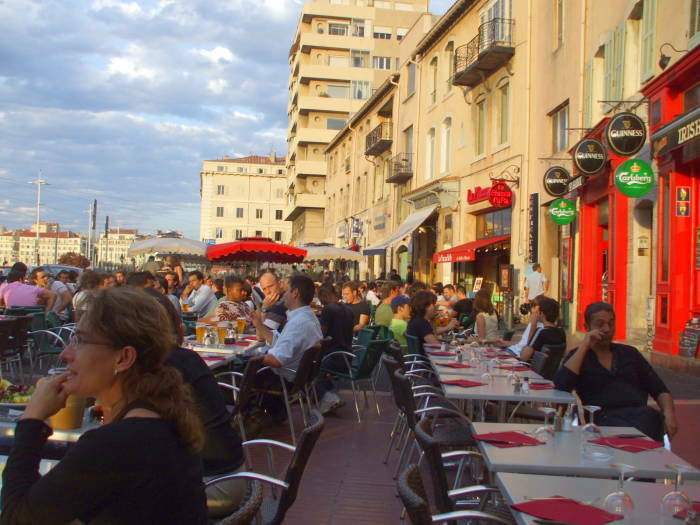 The distinctive dish of Marseille is bouillabaisse, a soup with assorted fish and shellfish along with vegetables. Many of the restaurants offer walk-in bouillabaisse, but purists maintain that you really have to plan this dish 24 hours in advance for the proper selection and preparation of the seafood. A big tureen of speculative bouillabaisse kept in the kitchen just in case someone asks — that just isn't done. Two distinctive café snack foods are tapenade, a paste made from capers, chopped olives, olive oil and sometimes anchovies; and anchoïade, a paste of anchovies, garlic, black olives and olive oil. Either might be served with thin strips of pita or with raw vegetables. 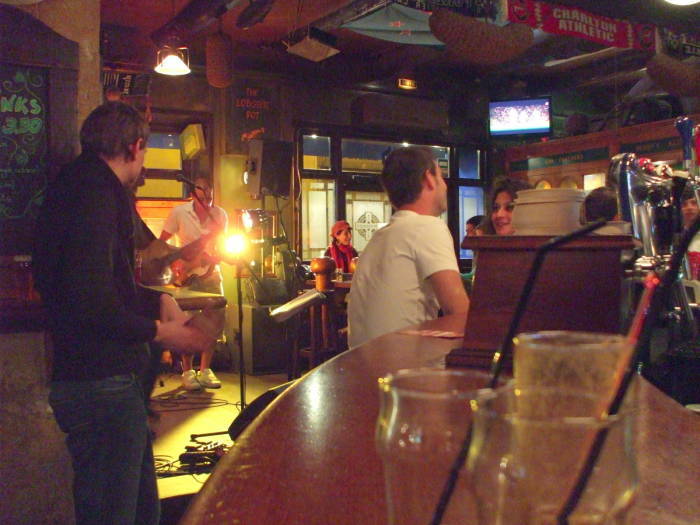 Many of the bars have live music in the evenings. Things eventually quiet down late at night. 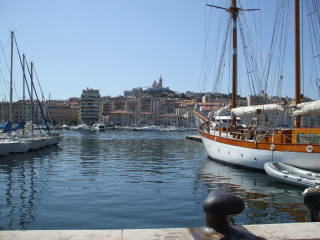 Marseille started with a wonderful natural harbor, and it has been further improved over the years. 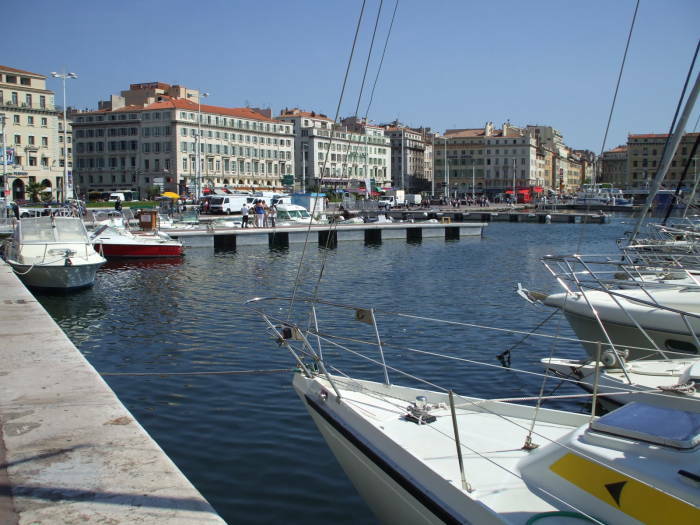 But now the Vieux Port is just for pleasure boats and small fishing boats. 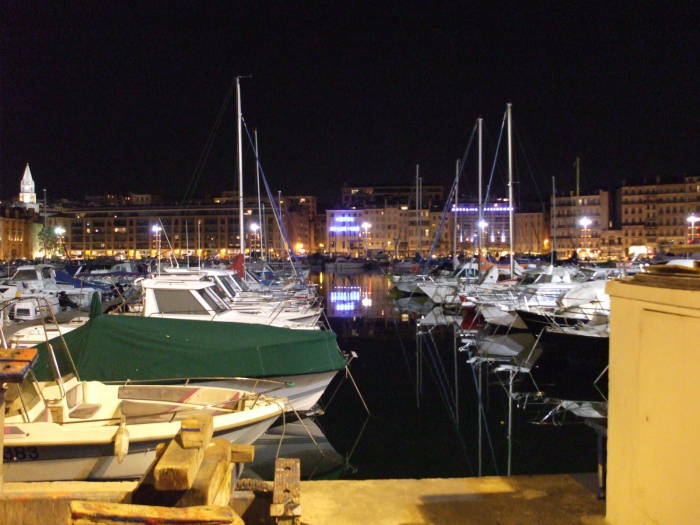 Marseille's shipping operations have far outgrown the Vieux Port. 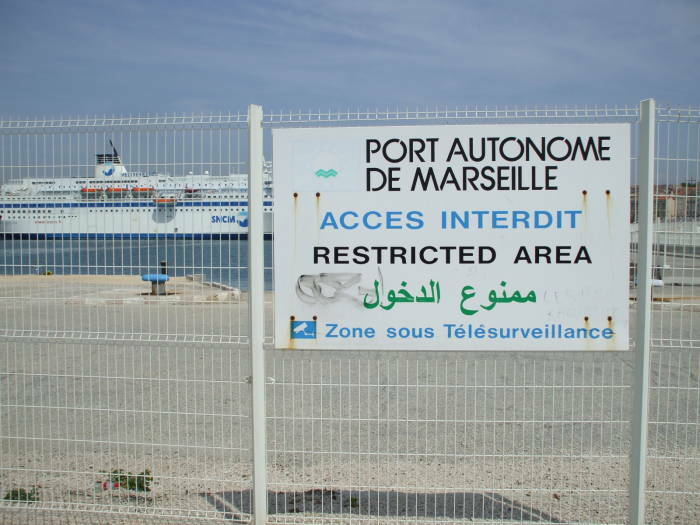 It is now France's largest commercial port, and one of the busiest shipping ports on the Mediterranean. 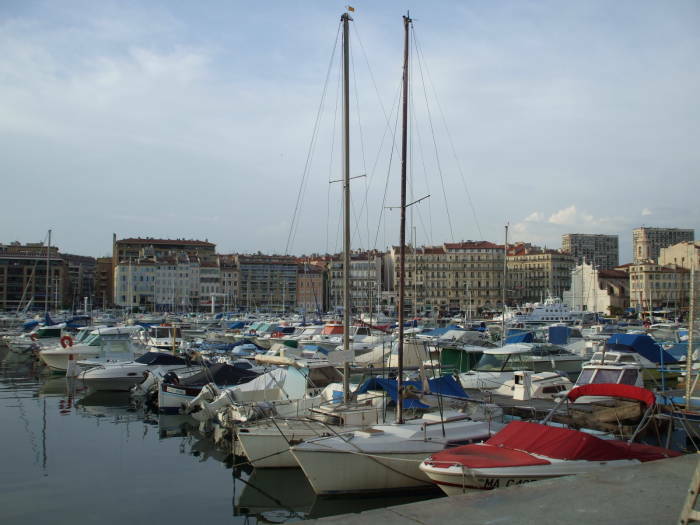 Here we see a small boat leaving the Vieux Port. A long breakwater extends in from the right and ends with a small lighthouse. The sailboat is near the opening to the Mediterranean, just to the left of that light. Then we continue walking ahead and turn to our left, looking out into the Mediterranean. Around 1510, King Manuel I of Portugal tried to ship a rhinoceros to Pope Leo X, on the theory that the Pope probably didn't own one yet but would like to have one, and so this gift would win lots of papal points for King Manuel and Portugal. However, the rhino carrier wrecked on the Île d'If, visible here just a short distance outside the harbor. Given that the French King Francis I didn't own a rhinoceros either, and in fact had never even seen one, he traveled down to Marseille to have a look at the beast. All this led to the construction of a fortress on the island, Château d'If. As a naval defense, Château d'If wasn't much of a success. The forces of the Holy Roman Empire, which never was very holy, Roman, or actually an empire, got past it and besieged Marseille anyway. But Château d'If did serve quite well as a very grim prison, something the French have excelled at even though their prisons are well known mainly for being overthrown multiple times and finally destroyed (the Bastille) or being escaped from in literature (The Count of Monte Cristo from Château d'If, Papillon from Devil's Island). Meanwhile, stories of the wondrous beast reached Germany, where Albrecht Dürer created a woodcut in 1515. He had only heard stories passed along, with inaccuracies added all along the way. He depicted something looking a little like a dinosaur wearing plate armor. The woodcut was a hit, though, and it was copied many times over the next three centuries. Versions found their way into textbooks, sculptures in churches, and paintings. 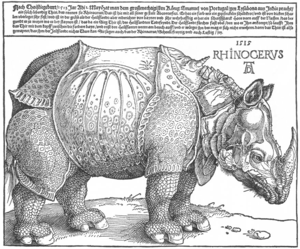 Up into the late 1700s this was pretty much what Europeans thought a rhinoceros was. 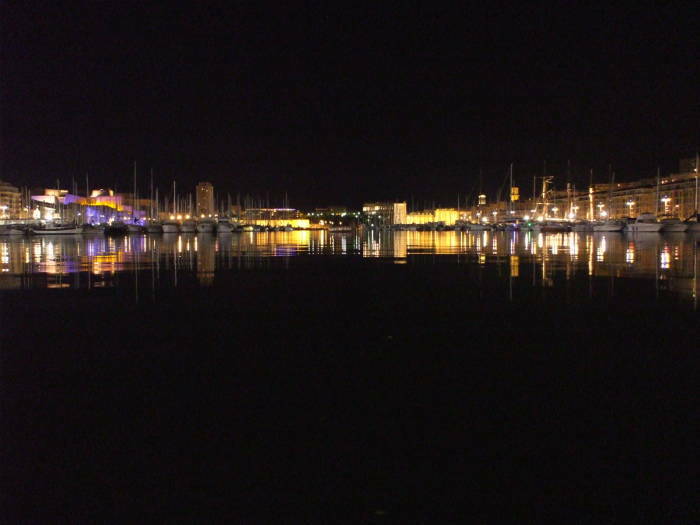 Here we have turned back to look back into the Vieux Port. 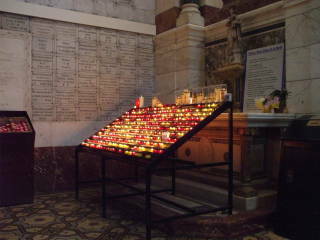 There is Basilique Notre Dame de la Garde up on the hill overlooking everything. On the left shore of the harbor opening is the 17th century Fort Saint-Jean, which incorporates the 12th century Commandry of the Knights Hospitalier of Saint John and the 15th century tower added to that by King René. The right shore has the Fort of Saint-Nicholas. Among the most prominent Marseille corporations are CMA CGM, the gigantic container shipping company; COMEX or Compagnie Maritime d'Expertises, a world leader in sub-sea engineering; and SNCM or Société Nationale Maritime Corse Méditerranée, a major operator of passenger and vehicle ferries and container shipping in the western Mediterranean. 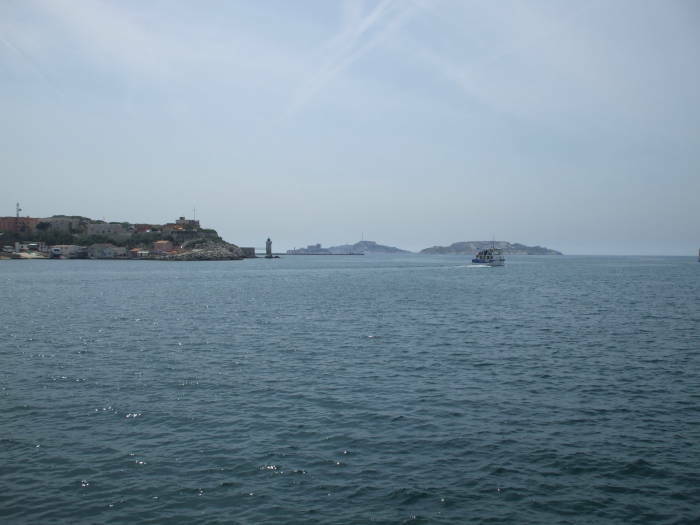 As of early 2019 Marseille had 13 submarine cable landing stations, over 130 connectivity providers, over 30 backhaul providers, and 4 Internet exchanges. The Marea cable, built by Microsoft, Facebook, and Telxius, has the largest transatlantic traffic capacity between the US east coast and Europe. 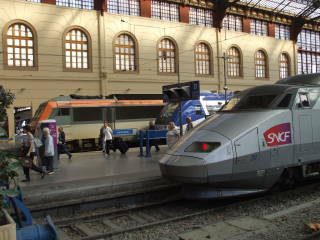 It lands in Europe in Marseille and Bilbao. 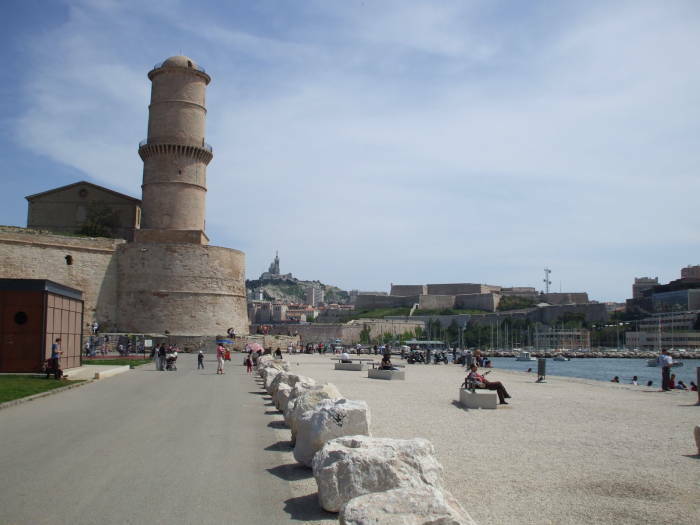 4 more cables were scheduled to land in Marseille by late 2019, pushing capacity to 300+ Tbps. 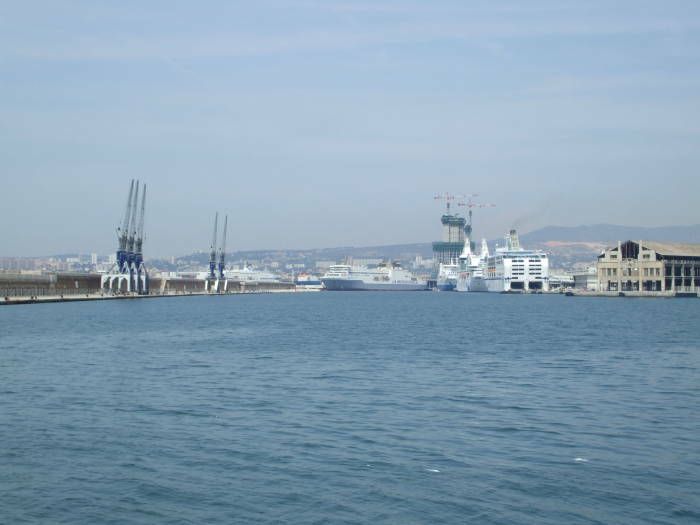 The new port of Marseille handles about 100 million tons of freight annually. 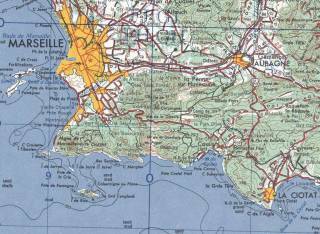 60% of that is petroleum, making Marseille the largest petroleum port in France and in the Mediterranean, and the third largest in Europe. 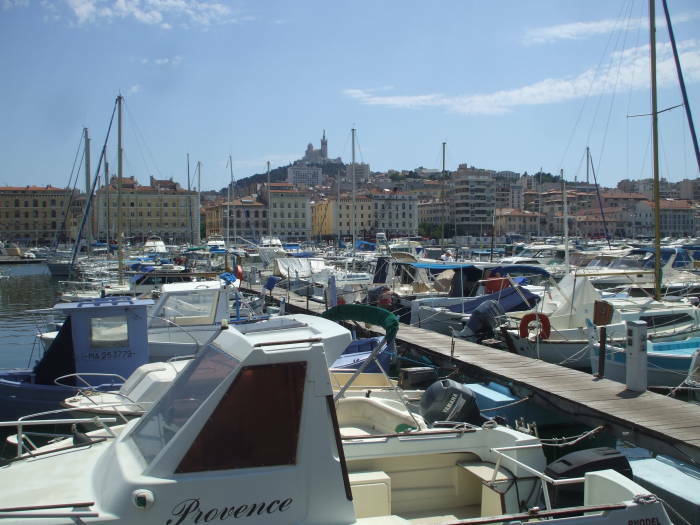 Marseille is also, logically, France's largest center of petroleum refining. Most of the remaining 40% of cargo is containers. 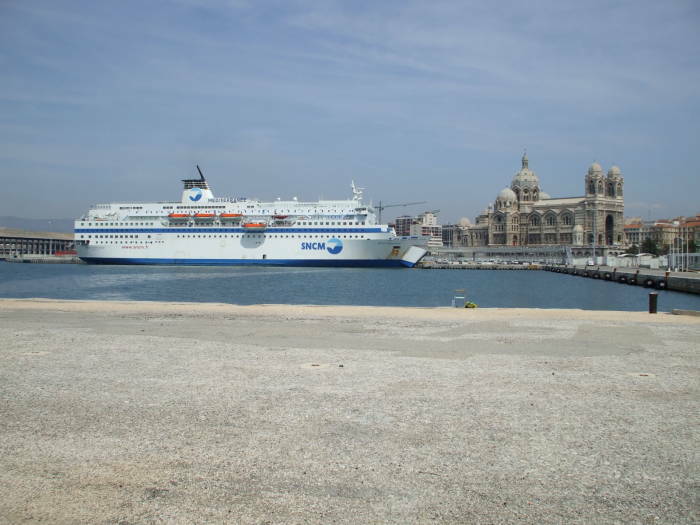 The Gare Maritime is a large ferry terminal with regular service to several destinations including Corsica, Sardinia, Algeria and Tunisia. Over 800,000 passengers pass through here annually. That SNCM ferry is docked near an unusual looking church. 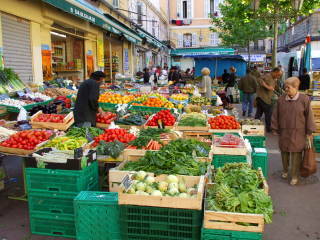 Let's go visit the Panier district.